What Does My Vehicle’s Exhaust System Do and How Does it Work? Your vehicle’s exhaust system is comprised mainly of a series of pipes. Most people know that an exhaust system removes the harmful gases produced in your engine; however, exhaust systems do a lot more! Your vehicle’s exhaust system has four main functions: control noise, carry away gases, improve engine performance and improve fuel consumption. Read on to learn more about each function and how they all work together to keep your car running! After the harmful elements have been removed from the exhaust gases, they travel through your vehicle’s muffler which dampens the sound of the gases leaving the vehicle. Exhaust gases are collected by the exhaust manifold and eventually routed out of the vehicle. The exhaust manifold acts as a funnel, catching gases from all cylinders and releasing them through a single pipe. The longer it takes for exhaust gases to leave your vehicle, the longer it takes to take in oxygen and generate more power. Having an exhaust system that’s in good working condition, or installing a performance exhaust system, will allow your vehicle to breathe better and faster – which means more power and better performance! Similar to engine performance, the quicker exhaust leaves your vehicle, the better fuel economy you’ll see due to the fact that your engine is free to take in more, fresh oxygen. Modern exhaust systems come with an oxygen sensor that measures how much oxygen is present in the exhaust. From there, more or less fuel can be added to maximize fuel economy. Exhaust Manifold: The exhaust manifold collects the exhaust from each cylinder and combines it into one pipe. Oxygen Sensor: Mounted on the exhaust manifold, the oxygen sensor measures how much oxygen is present in the exhaust and adds or subtracts fuel based on this measurement. Catalytic Converter: The catalytic converter converts the harmful gases released from your engine into water vapour and carbon dioxide. Muffler: The muffler quiets the exhaust as it escapes your vehicle. 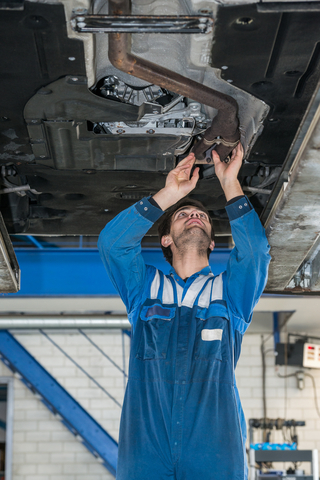 It’s very easy to spot a car with a faulty muffler – you’ll hear it coming from a mile away! Exhaust Pipe: The exhaust pipe connects all the parts listed above and carries the gases along their journey through the exhaust system. If you think you might have an issue with your exhaust system, call the experts at Park Muffler Radiator Brakes & Tires!